Peak growing season means overflowing farmers’ markets and home gardens so full you have to give away some of your harvest. An easy way to preserve vegetables is to turn them into quick vinegar pickles. Use a basic brine for a wide variety of produce, simply swapping out the main ingredient and the spices you pack into the jar. This quick pickle goes into the fridge for up to a month, so you don’t have to worry about sealing jars in a water bath the way you might have seen your grandmother do. 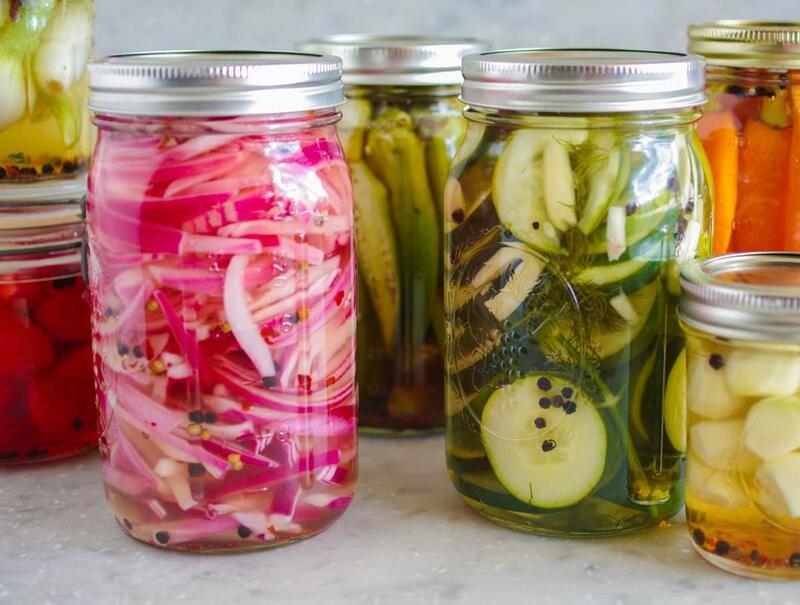 To make one quart — here we offer red onions, carrots, or cucumbers — fill a mason jar with one of the vegetables and its spices, ladle in hot brine, making sure the vegetables are completely submerged, then screw on the lid and leave to cool. If you don’t have canning jars, repurpose jelly jars or another jar you happen to have. You can double, triple, or even quadruple the brine to make more quarts at once. Don’t feel limited by these suggestions. The world is your pick. 1. In a heavy bottom saucepan, combine the vinegar, water, sugar, salt, and peppercorns. 2. Bring liquids to a boil. 1. In a 1-quart mason jar, combine red onions, coriander, and crushed red pepper. 2. Pour the hot brine into the jar to fill it; make sure onions are submerged. Screw on the lid and leave to cool on a cutting board. 3. Store in refrigerator for up to 1 month. Follow the brine instructions (above). Cut 1 pound carrots into spears that will fit into a 1-quart mason jar. Pack them into the jar with a 1-inch piece fresh sliced ginger and 1 teaspoon mustard seeds. Add hot brine; seal and store as for quick pickled red onions. Follow the brine instructions (above). Slice 2 unpeeled cucumbers into ¼-inch rounds. Pack them into a 1-quart mason jar with 4 large sprigs fresh dill and 3 cloves sliced garlic. Add hot brine; seal and store as for quick pickled red onions.